The Russian Defense Ministry has launched massive military exercises, involving over 2,000 troops and some 500 items of weaponry in southern Russia, including in the Caucasus. 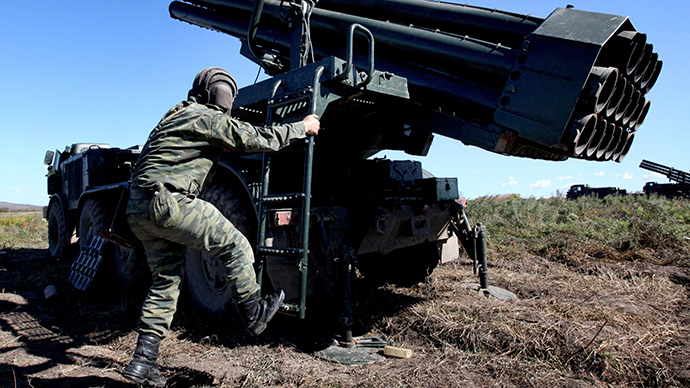 The field-type exercises of the air defense forces will be taking place until April 10 in twelve military firing ranges, located in Russia's South, the North Caucasus and Crimean Federal Districts, as well as at Russian military bases in Abkhazia, South Ossetia and Armenia. “Over 2,000 troops have been involved into the battle drills, and over 500 items of weaponry and military hardware are being used,” Interfax quoted a statement of the Southern Military District. The training day will last for 10 hours, and half of the drills will take place at night. During the month-long drills, Russian troops will be practicing tactical, special and technical skills, alongside driving modern military equipment, shooting and fire control. The drills involve self-propelled howitzers “Gvozdika”, multiple artillery rocket systems “Grad”, mortars “Podnos”, anti-tank missile systems “Konkurs”, and modern intelligence drones “Navodchik-2”. “At the end of the field drills, tactical maneuvers are planned,” the statement said. “They will also carry out operational reconnaissance of the air situation in conditions of the electromagnetic warfare”, it added. On Wednesday, a NATO flotilla of six ships arrived in the Black Sea to take part in the exercises with the Bulgarian, Romanian and Turkish ships, the alliance said in a statement, stressing that the training will take course “in full compliance with international conventions”. Russia carries out military exercises on a regular basis. The country’s south saw 1,700-strong drills of radiation resistance troops in February, and the Pacific Fleet of the Russian Navy is set to exercise in the sea of Japan.